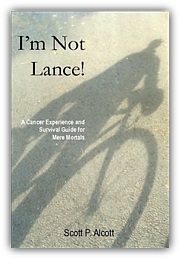 Scott Alcott, a Ewing's sarcoma survivor, is the author of I'm Not Lance!, a book for cancer patients and their supporters. The book gives a tour of the practical, social, and psychological challenges faced by those who deal with cancer, and it offers tips for how to manage those challenges. At the age of 40, Scott was diagnosed with an unusual case of Ewing's sarcoma in the deep tissue of his face. Scott's friends kept sending him Lance Armstrong's book for inspiration, and Scott had a hard time relating to it. Scott said, "Lance's endurance, discipline, and competitive spirit is legendary and hard to emulate; I wanted to write a book for regular people." Scott emphasizes that I'm Not Lance! is not an autobiography: "It has many moments of controversy and sometimes blunt assessments. I've dared to say what patients, supporters, and doctors actually think, with an eye on raising understanding and better dynamics between these wonderful and caring people." Scott hopes that the book can help others to feel understood, supported and better prepared to deal with sarcoma. Proceeds from the sale of the book will be donated to the Liddy Shriver Sarcoma Initiative. Scott explained: ""When I was scared, overwhelmed and confused, I found an amazing group of people supporting each other at the e-sarc Yahoo user group. Bruce Shriver, Mimi Olsson, and scores of others welcomed me in and helped me until I was able to begin helping others. Liddy and her family seem to infect others with positive values and that impressed me." Scott's book is available in paperback, instant download and Kindle formats.